Check out our events page and join the fun! The richest value of wilderness lies not in the days of Daniel Boone, nor even in the present, but rather in the future. 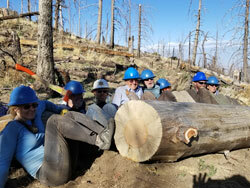 New in 2019, the Arizona Wilderness Coalition has begun offering a series of training events for those interested in Wilderness Stewardship. 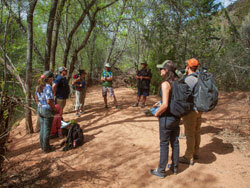 Our first two day event, held in early April 2019 in the Sycamore Canyon Wilderness, covered the topics of Wilderness History and Leave No Trace principles. Learn more about our Stewardship Training program! We invite you to join us on a Wilderness Stewardship trip! Our goal is simple, we go out into wilderness areas (and potential wilderness!) to report on what we see, maintain trails, and preserve wilderness. Exploration, monitoring, and maintenance are key to the integrity and sustainability of our remaining wild places. What could be better? 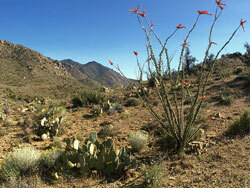 We hike/backpack into amazing places throughout Arizona and provide a huge benefit for our wild lands and waters! Get all the details! 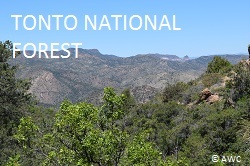 The large-scale revision of the Tonto National Forest (TNF) Land and Resource Management Plan is moving ahead with the official release of the “Notice of Intent” to revise the Plan. With 3 million acres, seven wilderness areas and two wild and scenic rivers, there’s a lot at stake. Learn more here. This spring AWC will be community organizing in Kingman and Safford, AZ. Our goal is to share with the public, the BLM, and stakeholders our conservation concerns relevant to the Travel Management Plan; empower citizen advocacy; and come up with responsible and practical negotiations. Read more and learn how you can participate. 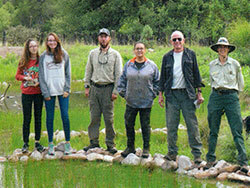 The National Forest Foundation's newsletter recently featured an overview of a Chiricahua leopard frog habitat restoration project the Arizona Wilderness Coalition organized in the Chiricahua Mountains. Read the details of this project. 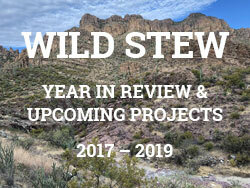 Our wilderness stewardship program has been busy in the past couple years, with 35 projects across Arizona and well over 100 volunteers engaged. View our 2017 - 2019 year in review and upcoming projects. 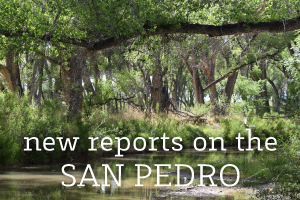 In May the Bureau of Land Management released San Pedro Riparian National Conservation Area's reports for Wild and Scenic River eligibility and Lands with Wilderness Characteristics. Read more. Quiet recreation on BLM lands provides an estimated $162 million in spending impact for Arizona, according to a new study from the Pew Charitable Trusts. 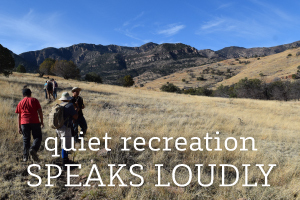 These findings offer great support for the need to retain, maintain, and preserve public lands in a natural state as a foundation for hiking, birding, hunting, mountain biking and other quiet recreation pursuits. Read more.